For anyone who knows me, whenever I visit a new city I fall in love with it and tirelessly try to convince my husband to move there! Charleston was no exception. 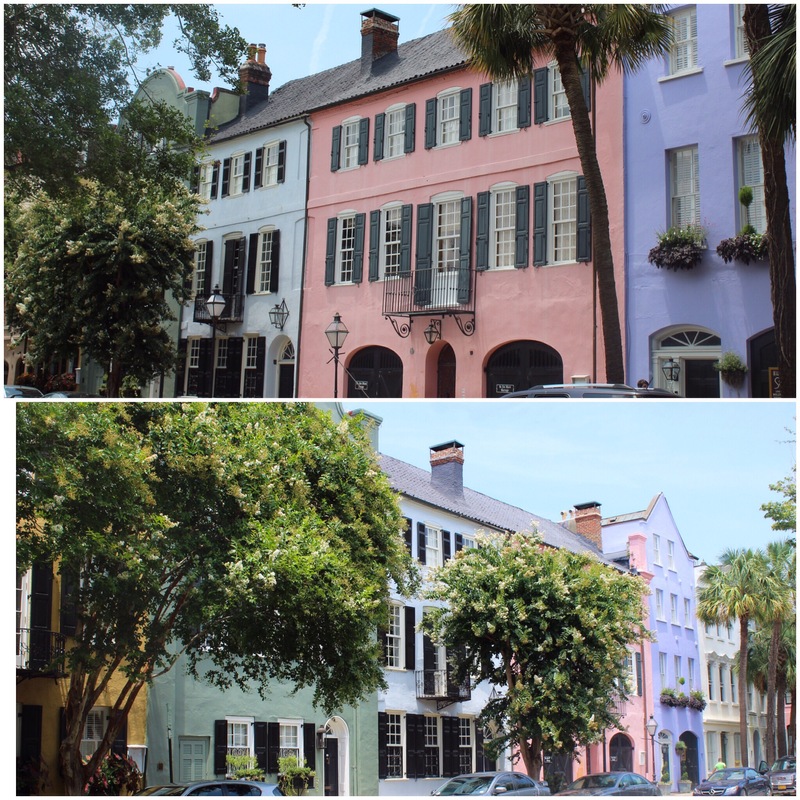 The cobblestone streets, pastel colored houses, and waterfront drew me in. The enchanting city is filled with history, eclectic resturants, bars, and shops around every corner. We spent three nights exploring and relaxing (hey we were on vacation after all!). There was definetly enough to see and more we wished we did see. 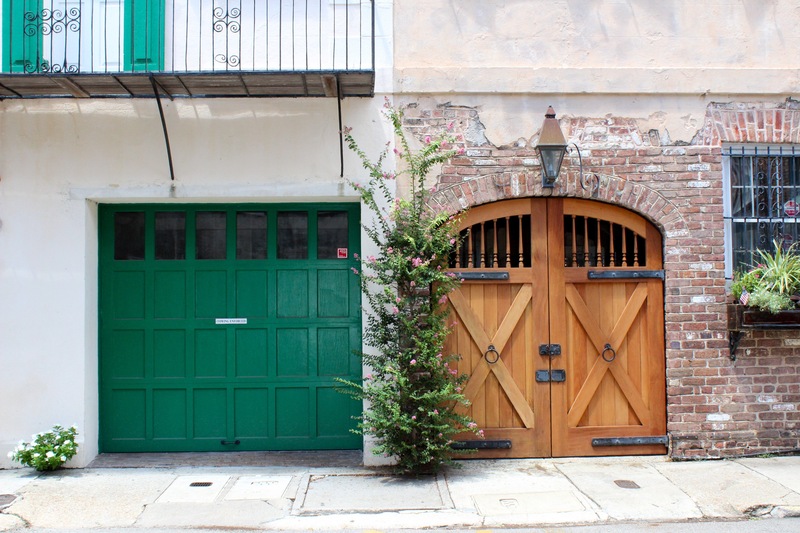 Charleston is going to remain on our “must visit” list! There was so much more I wish we had time for. 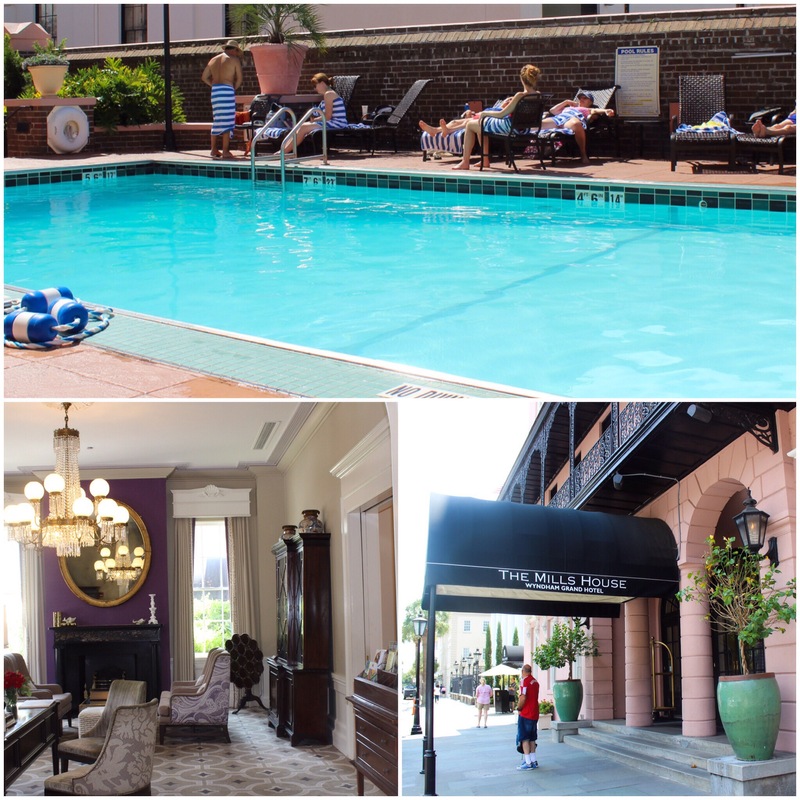 We arrived mid-morning to our hotel, The Mills House Wyndham Grand Hotel, which is a modern downtown hotel with an outdoor pool, restaurant, and bar. Luckily our room was ready, so we dropped off our luggage and set out to explore! 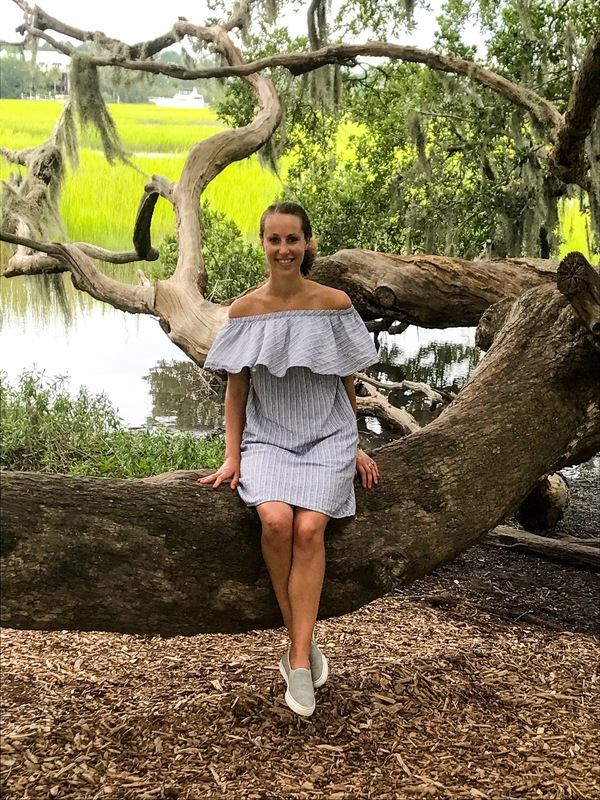 Because Charleston is a small city, we walked to every area we wanted to see on the first day! 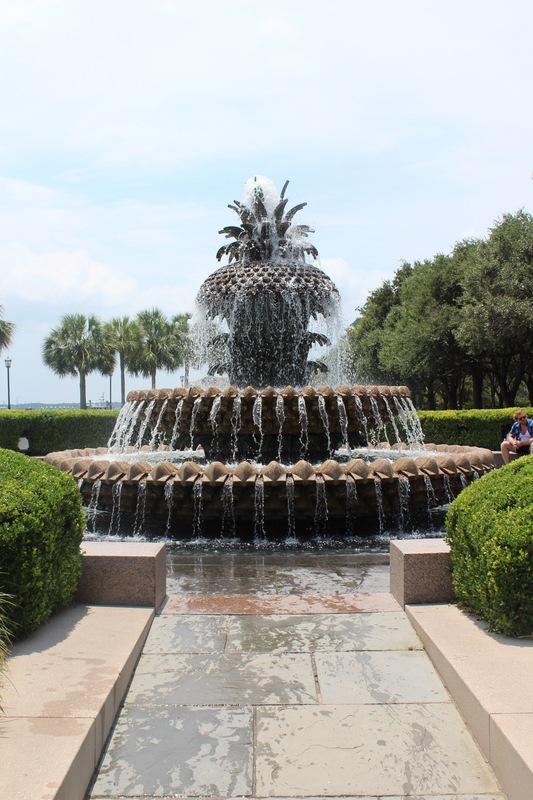 We visited the Pineapple Fountain, Rainbow Row, the Waterfront, and Battery Park. And of course we stopped along the way to admire the views and take pictures, lots and lots of pictures. Charleston in July is hot, no way around it, so by mid-afternoon we were ready for a break. We headed back to the hotel and laid out by the pool for a few hours. 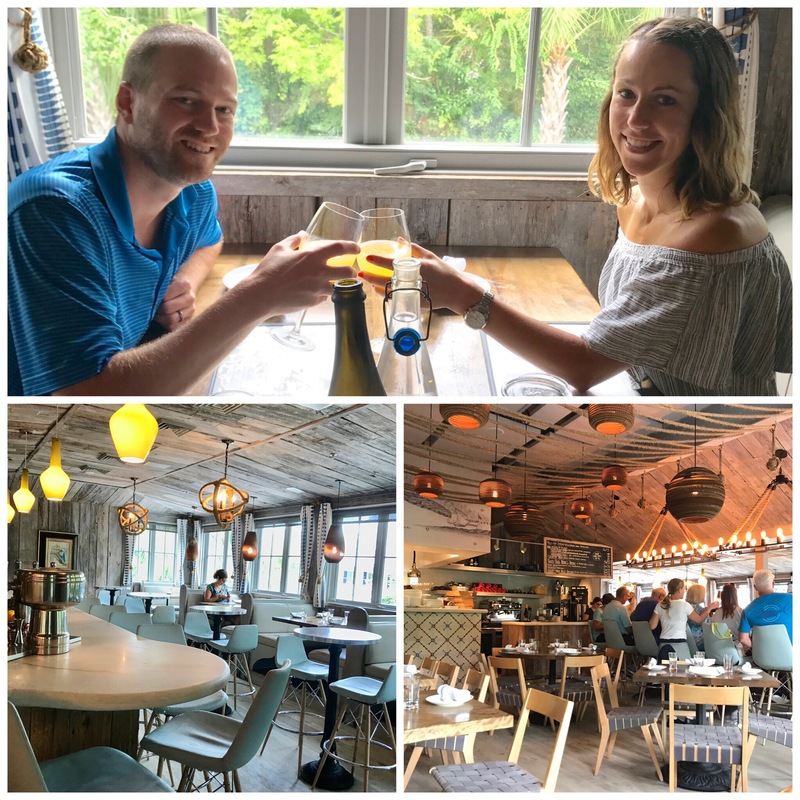 After resting up and showering, we went out for happy hour at Pearlz Oyster Bar (click here to read about all the restaurants we visited in Charleston). 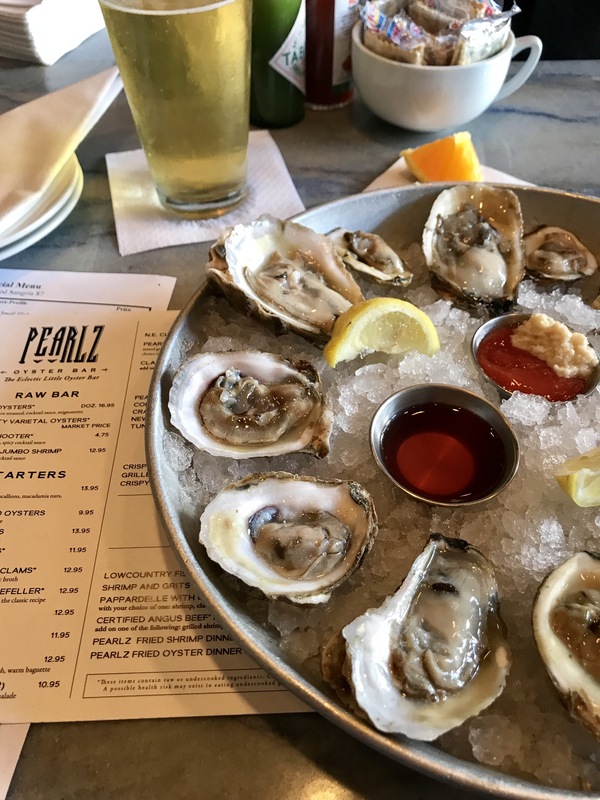 Pearlz Oyster Bar serves fresh seafood and Low country recipes. We got the last two seats at the bar and ordered a dozen oysters! Happy hour special was $1 oyster, so how could we not! We met a friendly couple sitting next to us at the bar and spent the next couple hours chatting with them. 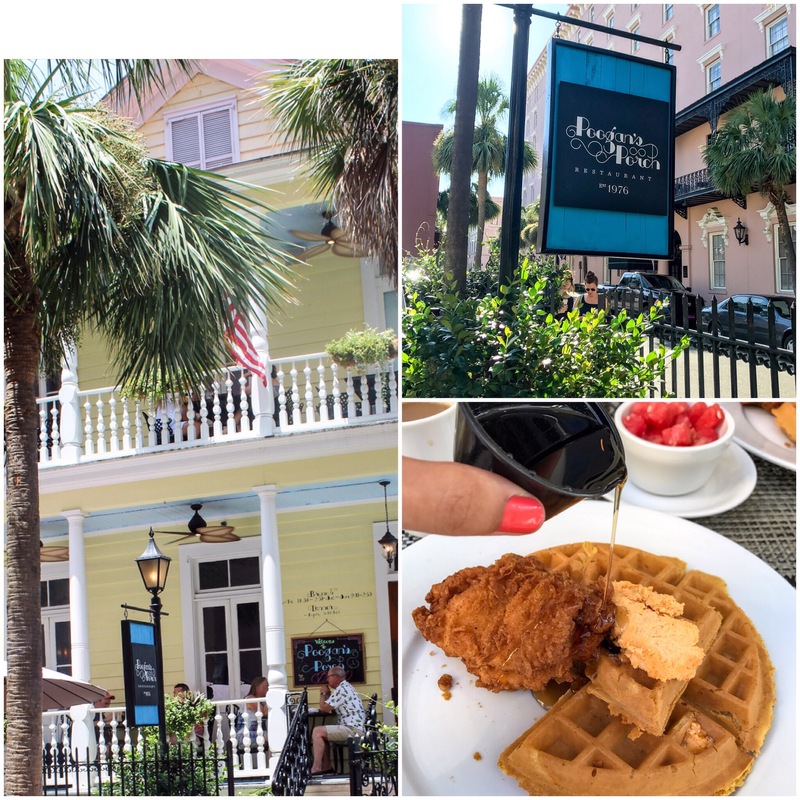 They were Charleston locals and the true definition of southern hospitality! Tip, whenever traveling, ask locals for recommendations; nobody knows a city better than the locals. For dinner we went to Eli’s Table. This was our favorite meal of the whole trip! 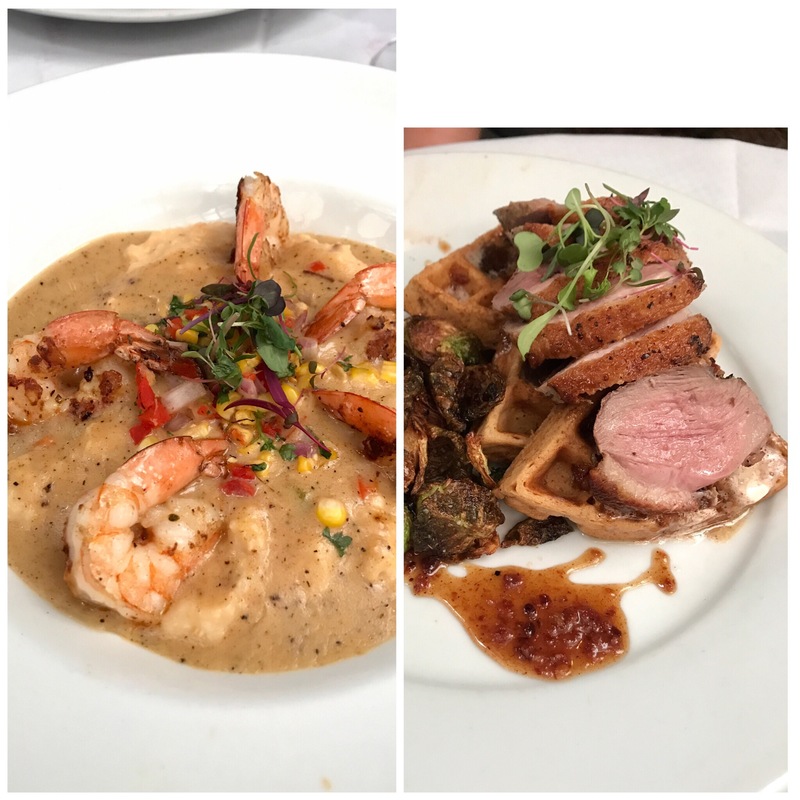 Wanting to experience some true Low country cooking, I ordered shrimp and grits and Brian ordered roasted duck over waffles. They both were unbelievable. According to Critic’s choice, the shrimp and grits at Eli’s Table has been ranked #1 two years in a row! 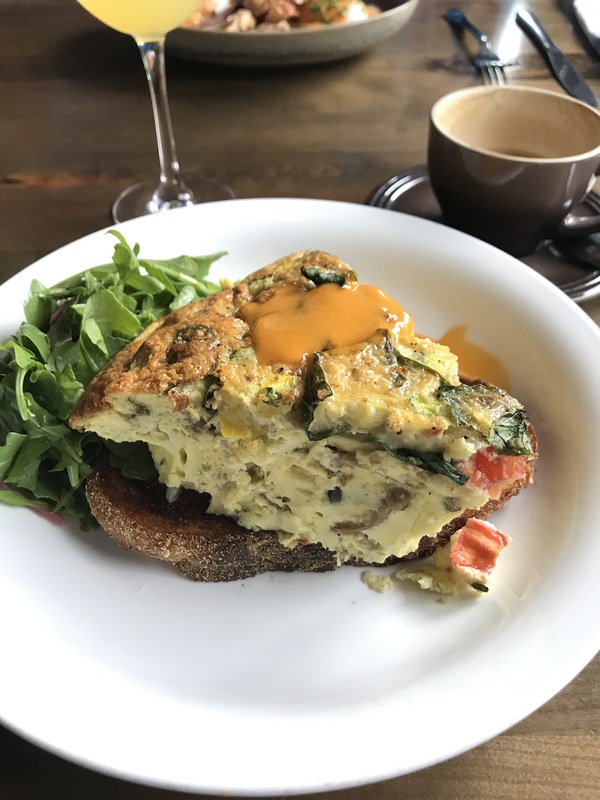 To read about what other restaurants we visited on day one, including the ever popular 167raw, click here! Wanting to explore some of the surrounding towns, we rented a car through Turo.com. Turo is an online local renting company where you select cars owned by locals. We rented a Kia Forte that cost us $39 for the day. Looking for something fancy? Rent a Maserati or Mercedes. Traveling with a family? Book a minivan. After the car was booked, we were emailed the location for pick up and drop off. It was simple and easy! We drove out to Sullivan’s Island, which was a short 20 minute trip over the Arthur Ravenel Jr. Bridge. 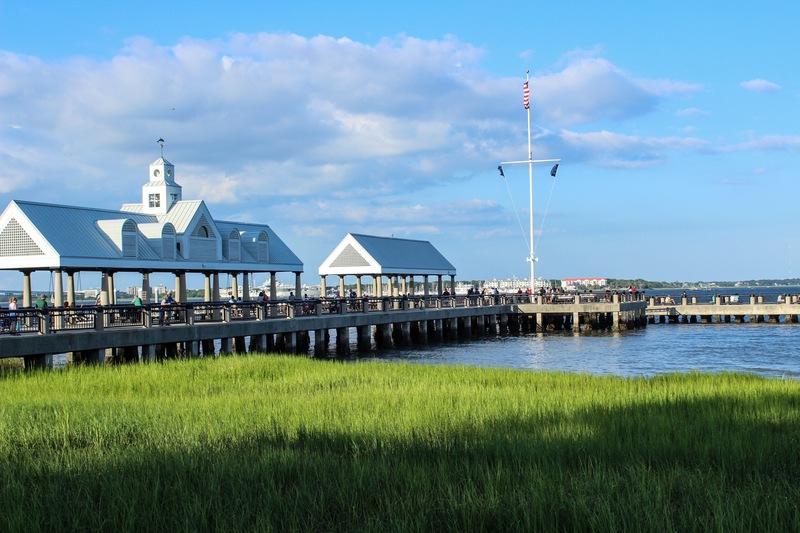 The bridge offers impressive views of Charleston. If you’re feeling ambitious you can walk, run, or bike over the bridge. We were not feeling so adventurous; we had eating and drinking to do! We had breakfast at The Obstinate Daughter, which was ranked the best brunch in the Charleston area by thrillst.com. 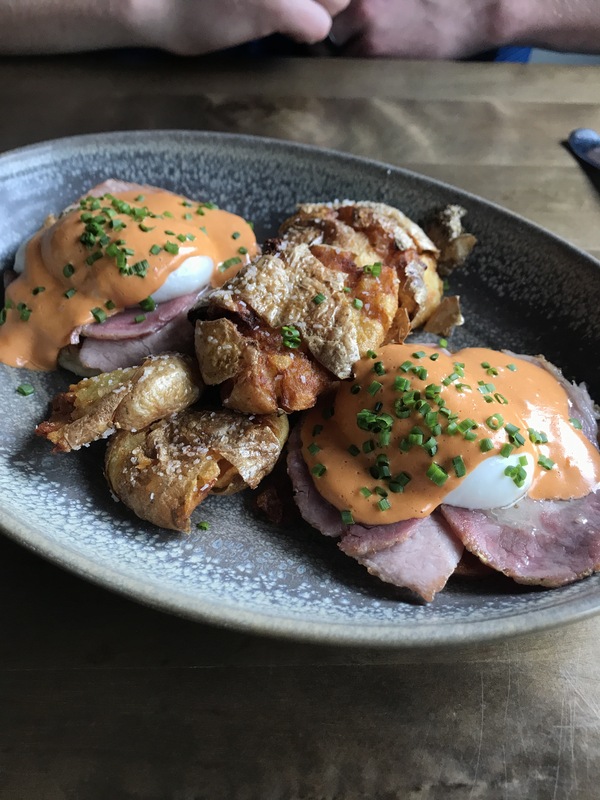 The chic ambiance with natural wood floors and Edison bulb floating chandeliers mixed with a nautical theme was the perfect place to cozy up in a booth with mimosas and giant breakfast portions of eggs Benedict and vegetable frittata. 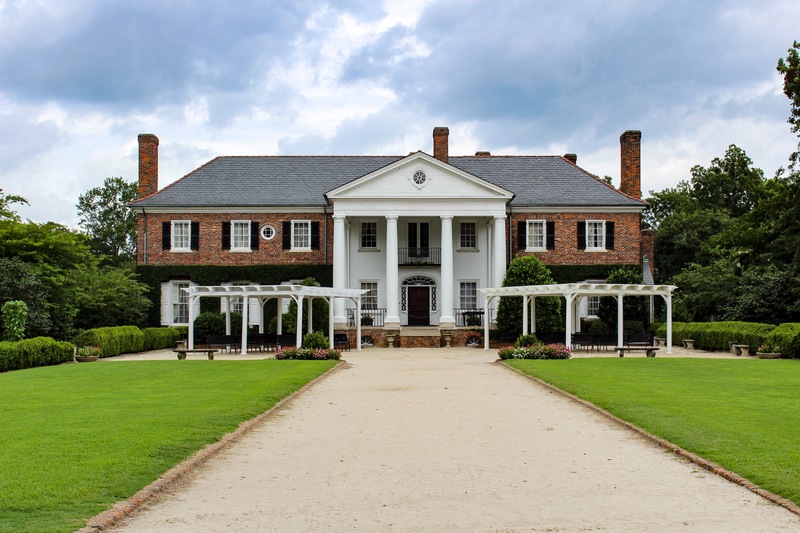 After breakfast we drove to the Boone Hall Plantation located in Mt. Pleasant, SC. 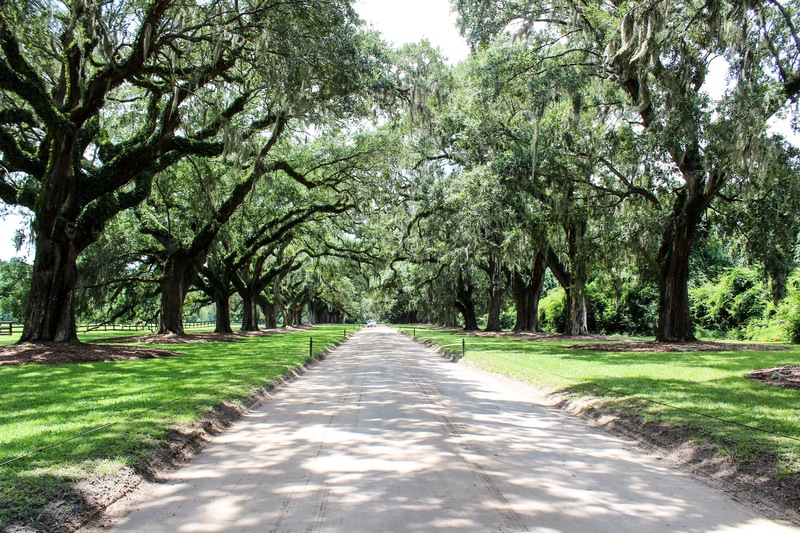 The plantation was founded in 1681 and has gone through numerous revisions and owners through the years. One of the more interesting facts we learned was in the 1940’s the then owner Dimitri Jorjadze, a Georgian prince, owned thoroughbreds. One of the horses, Princequillo, was the fastest distance runner in the United States. Princequillo descendants include Secretariat, Seattle Slew, and American Pharoah, all winners of the triple crown! Admission to the plantation is $24 for adults ($21 if you have AAA) AND $12 for kids ages 6-12. 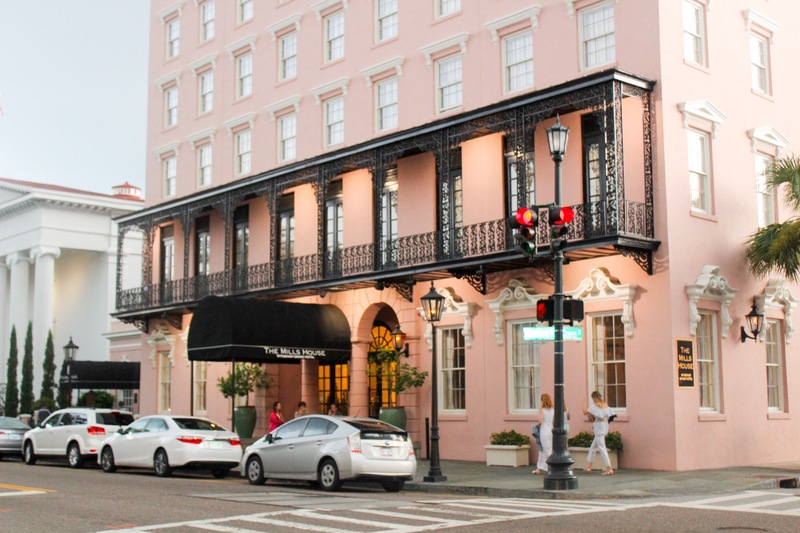 The price includes a Black History in American exhibit, the plantation house tour, a coach tour of the plantation, the slave street and history tour, access to the beautiful gardens, and the most impressive attraction: the entry down the famous Avenue of Oaks. 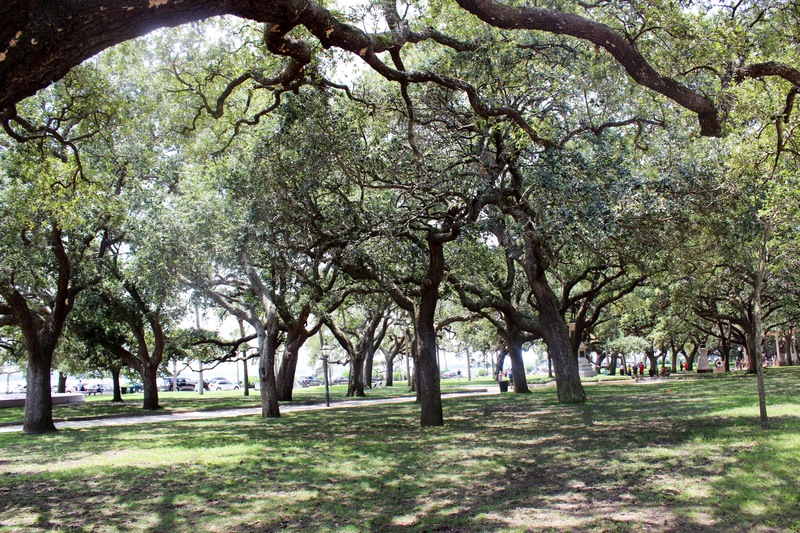 Eighty-eight Live Oak trees were planted generations ago, some more than 500 years old. The sprawling trees line the long driveway leading to the house. I could have stayed for hours taking pictures of the stunning trees! 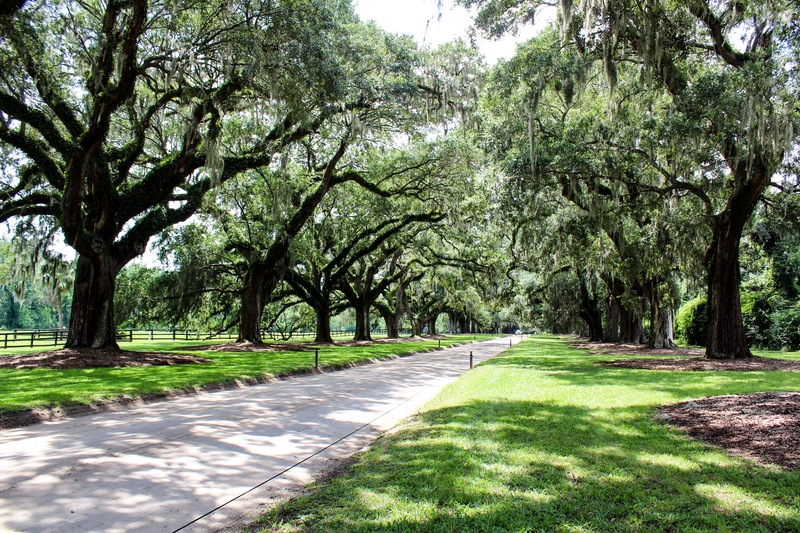 The house tour itself was short and only included four rooms, but the Avenue of the Oaks and knowing that I was standing in the same place that scenes from the Notebook were filmed made the trip well worth it! Before heading back to our hotel, we stopped at two breweries, Westbrook and Revelry. Clearly the craft beer scene is blowing up in places other than Connecticut; they both had a good variety of brews to choose from. For dinner Saturday night, we made reservations at FIG, which came highly recommended and I can see why. FIG offers elevated takes on Southern classics. The menu changes seasonally. One tip is to make reservations early, aka exactly four weeks before you want to go! To end the night we walked down to Carmella’s, a cafe and dessert bar; it was basically an adult’s dream! The swanky bar consisted of alcoholic desserts. We split a smores cookie sandwich and a death by chocolate drunken alcoholic milkshake! To read about the other restaurants from day two click here! 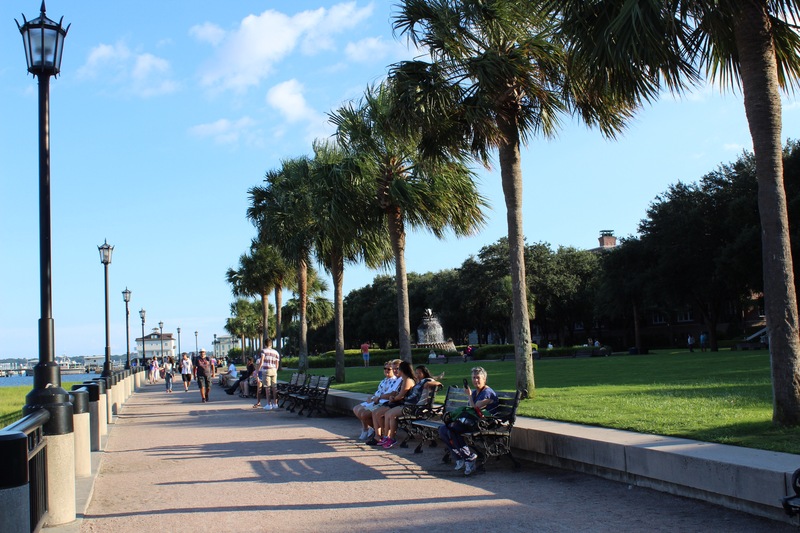 This was the best weather day of the weekend, a beautiful, sunny and non-humid day in Charleston. We had breakfast at Poogan’s Porch, which is right across the street from the hotel. This is another place you should made reservations at! We both ordered the house favorite, fried chicken and waffles and shared an order of fried green tomatoes to start! Hey, when in Rome! We spent the rest of the morning and early afternoon by the pool! By mid afternoon we were ready to explore again. We went back to the Markets. 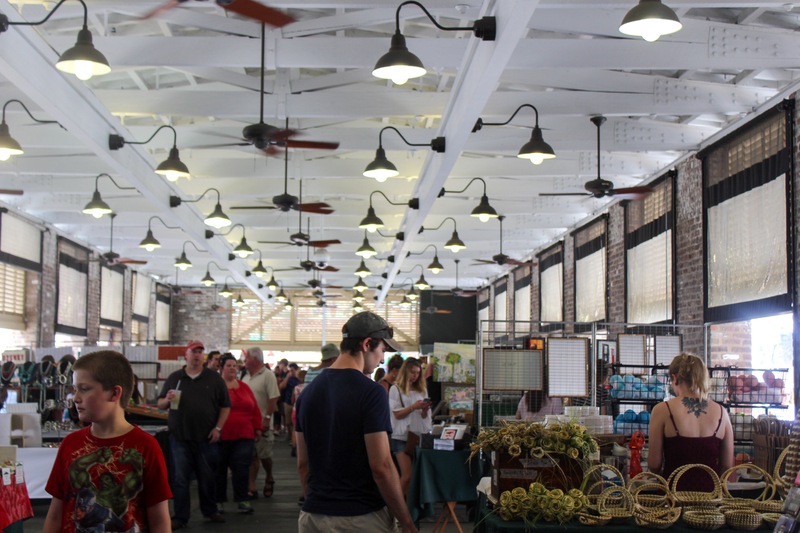 The City Market is in downtown and stretches four city blocks. 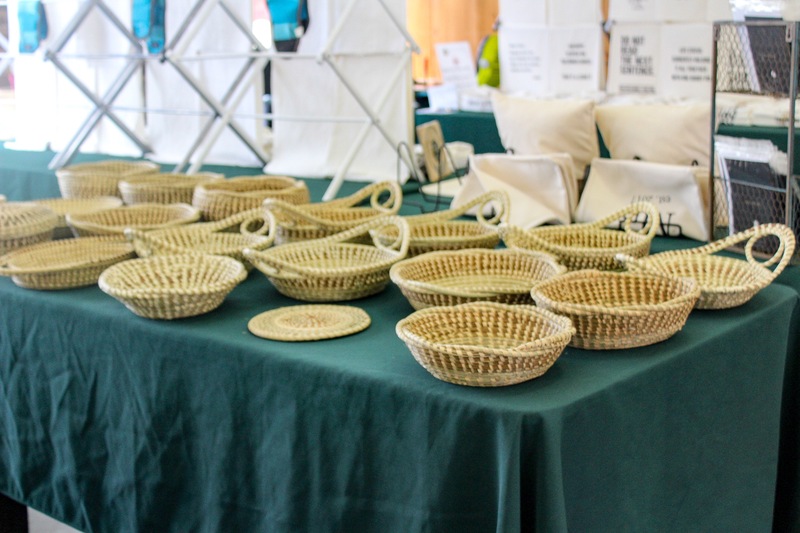 Vendors sell everything from spices and cookbooks to jewelry and Gullah sweet baskets. 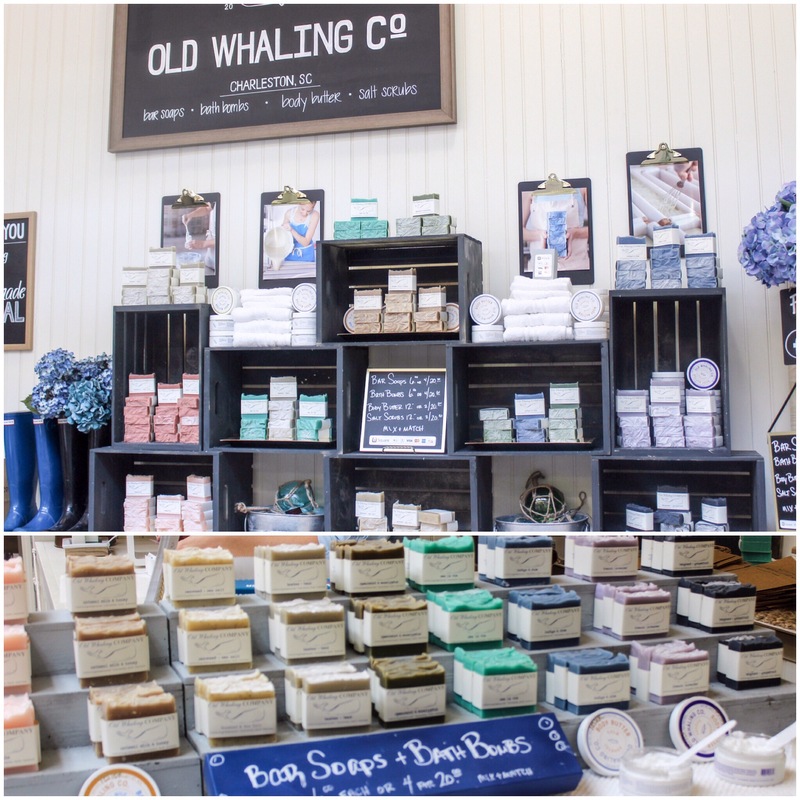 I couldn’t resist stopping by a stand with natural soaps made by Old Whale Company. The colors reminded me of Rainbow row. 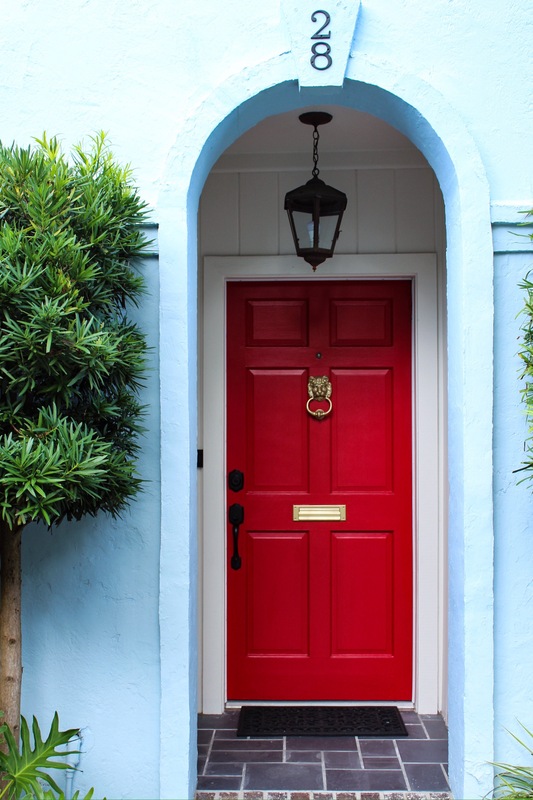 We explored a little more, getting lost walking down the cobblestone streets and taking pictures of every pretty house! Wanting to take advantage of the beautiful weather, we went to the Vendue for rooftop drinks before heading over to dinner at Blossom. 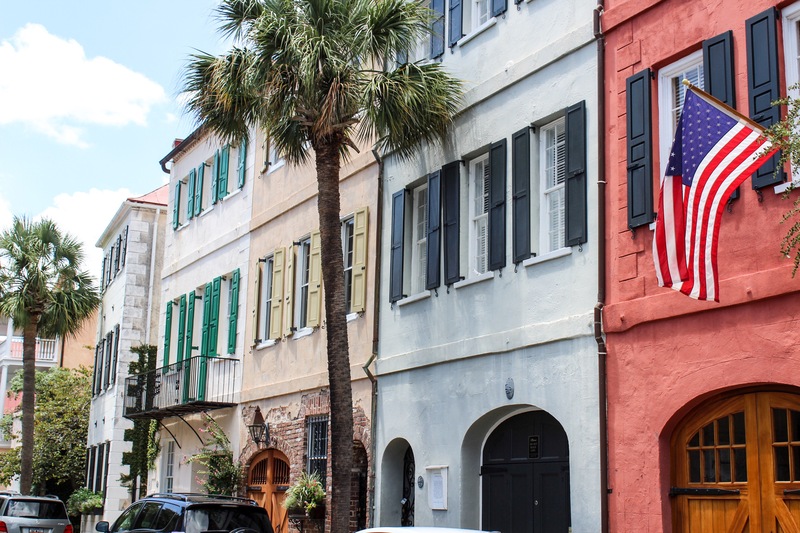 To end the trip we took a walk over to King Street, which is known as the historic shopping district in Charleston. 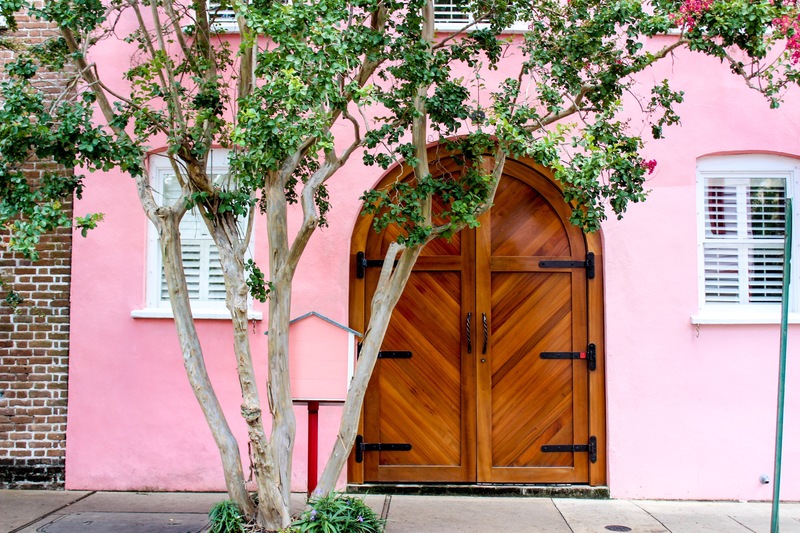 Rodeo Drive meets Southern charm. We stopped for breakfast at Callie’s Hot Little Biscuit. As soon as I opened the door my mouth started watering. 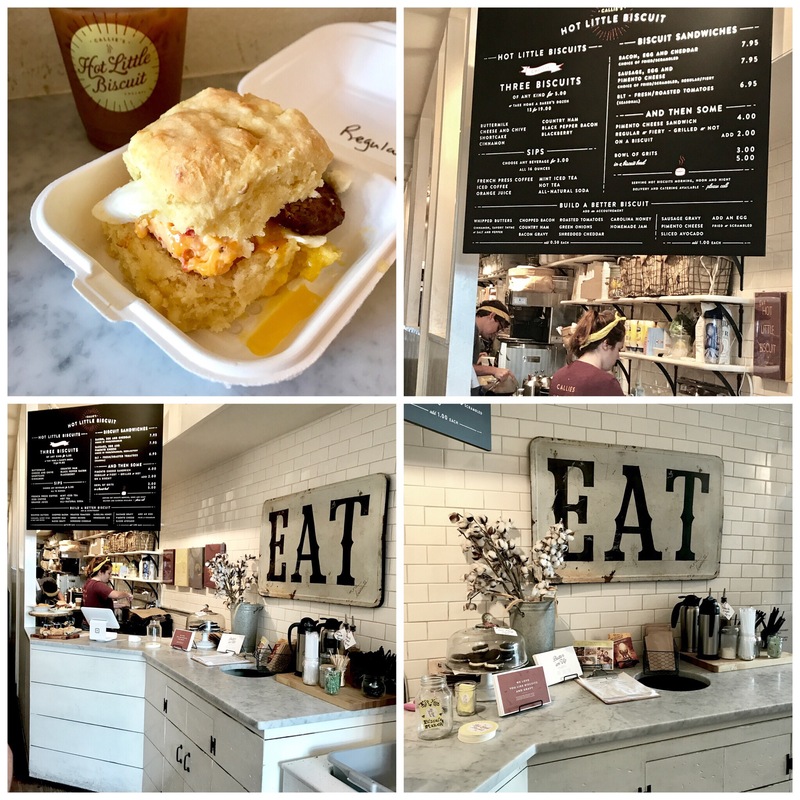 Callie’s serves up seven different types of biscuits including buttermilk, cheese and chive, and cinnamon, in addition to breakfast sandwiches served on hot, flaky biscuits. We each ordered a sausage, egg, and pimento cheese biscuit sandwich. Callie’s is a small, order-to-go breakfast place. We went in on a Monday and were able to get 2 of the 6 seats available. If you visit on a weekend plan to wait in line and take your order to go. Can’t wait to visit again! Make sure to read my post about all the restaurants and bars we went to including who I ranked for best food, best decor, and best overall!